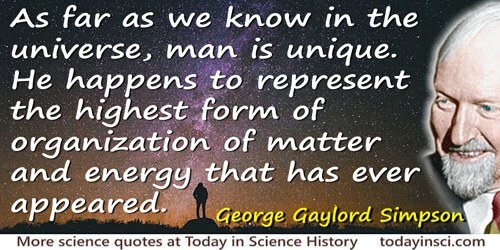 As far as we know in the universe, man is unique. He happens to represent the highest form of organization of matter and energy that has ever appeared. In The Meaning of Evolution (Rev.Ed. 1967), 345. It is still false to conclude that man is nothing but the highest animal, or the most progressive product of organic evolution. He is also a fundamentally new sort of animal and one in which, although organic evolution continues on its way, a fundamentally new sort of evolution has also appeared. The basis of this new sort of evolution is a new sort of heredity, the inheritance of learning. This sort of heredity appears modestly in other mammals and even lower in the animal kingdom, but in man it has incomparably fuller development and it combines with man's other characteristics unique in degree with a result that cannot be considered unique only in degree but must also be considered unique in kind. In The Meaning of Evolution: A Study of the History of Life and of its Significance for Man (1949), 286. Man has risen, not fallen. He can choose to develop his capacities as the highest animal and to try to rise still farther, or he can choose otherwise. The choice is his responsibility, and his alone. There is no automatism that will carry him upward without choice or effort and there is no trend solely in the right direction. Evolution has no purpose; man must supply this for himself. The means to gaining right ends involve both organic evolution and human evolution, but human choice as to what are the right ends must be based on human evolution. The Meaning of Evolution: A Study of the History of Life and of its Significance for Man (1949), 310. Only when Genius is married to Science can the highest results be produced. Education: Intellectual, Moral, and Physical (1889), 81.